I'm going to make a prediction. Much in the same way that some cities have become a safe-haven for illegal immigrants, some cities and towns will be enacting a sort of “Second Amendment Sanctuary City” status. After all, if you're reading this humble website I can bet that we likely agree on one thing: Gun control violates the Second Amendment. If you don't agree with that, I'm sure that we can agree that you're here just to troll us. That's fine, and who am I to violate your First Amendment right? Second Amendment Sanctuary Cities are already among us. Brian reported on one Washington city, here, that is already ruling gun control measures as unconstitutional. The main issue with the way that city is doing it, is that it isn't clear if they have the support of the local Sheriff, which is a necessity for keeping out the gun grabbers. The county Sheriff, though not present in three of the 50 states, is often regarded as the highest law enforcement officer in the land–capable of removing federal and even un-elected state officials from within its boarders–will likely be needed to go up against all that will come down upon that small city in Washington. Make no mistake, they are taking a page right out of our opponent's book and applying it to gun rights. After all, the right of self-defense is written in the law of the land and shall not be infringed. (We'll touch more on the supreme law of the land in a bit.) Further, when the Second was written it applied to all arms to include those the military had–not just pea shooters. Therefore, we can surmise that as it stands today the founding fathers would also expect that the Second Amendment apply to semi-automatic guns, like the Ar-15. Any federal regulation enacted by Congress or by executive order of the president offending the constitutional rights of my citizens shall not be enforced by me or by my deputies … In summary, it is the position of this sheriff that I refuse to participate, or stand idly by, while my citizens are turned into criminals due to the unconstitutional actions of misguided politicians. How outstanding is that? This time around we aren't fighting against a Tyrannical federal government, but confused (or corrupted) state governments. I believe in a citizen's right to carry. Even in the most profoundly anti-gun state in the country, this county police officer believes in the citizen's right to protect him or herself. He believes in the Second Amendment. I'm not a betting man, but if I were, I'd bet that county police officers across the nation believe similarly. Many folks are likely wondering how this is even possible. I mean, how can a lowly, local cop go up against his/her state? I'll make an attempt to break this down the best I can. Please understand that I'm not an attorney and this is just my understanding of things how they currently are. We have what is known as the Supremacy Clause of the Constitution. It is Article Six, Clause 2. It basically says that what is found in the Constitution and laws derived from it, should be followed regardless of what the local or state laws say. The local county and even city police can cite the Supremacy Clause of the Constitution as the supreme law of the land and that the gun control laws are unconstitutional regarding our interpretation of the Second Amendment. Interesting stuff huh? When you get down to the bare bones of it, that local police chief cited in Brian's article or any Sheriff who stands up to anti-gun legislation at the state level is only following the RIGHT law, being that the Second Amendment says the right to keep and bear arms shall not be infringed. If (and until) that Amendment is repealed or overturned in some way the states must (should?) (please?) follow the federal laws on the books. To do anything else would be illegal. And, in all honesty, I think it's about time we had a Supreme Court ruling on the Second Amendment. We need to firm up what it means so everyone has to follow it, regardless of beliefs. Then do yourself a favor and stack as much as you can on your side with Branca's highly acclaimed The Law Of Self-Defense book. the constitution is the law of the land and the second amendment is not to be infringed PERIOD. I grew up hunting and served the UNITED STATES OF AMERICA FOR 6 YEARS . I swore an oath and I HAVE NOT BEEN RELEASED FROM IT. AMEN. How did we get here. Judges and elected officials blatantly ignoring the Constitution. I pray that there will be many cities and people in office that will say enough is enough and openly challenge the decisions being made by these self imposed Gods, and say no, we are not going to impose these decisions that clearly ignore the Constitution. I submitted a SIMPLE ,ACCURATE, REASONABLE comment. B U T , THE SITE COULD NOT BE REACHED. If you will schedule a vote for a second amendment sanctuary city/state I will come and I will vote FOR. I must confess that I’m a bit surprised and dismayed that SCOTUS hasn’t already put this on their judicial plate. But, it’s coming, my friend… and sooner than we might think. Sorry brother (fellow jarhead) but I take issue with several of your points. First, your comment about gun carriers, under the second amendment, can carry any weapon including what the military uses. In your interpretation, I should be able to have a nuclear weapon – the military does! We are always able to modify the constitution to reflect the times. They are called amendments…like the 2nd amendment. Secondly, the supremacy clause came about over state’s rights. County sheriff’s are not imbued with special enforcement rights. They report to the county or state. They work for them, not the US constitution. Finally, I am from a highly regulated state when it comes to CC, Massachusetts. I don’t always agree with the laws they pass but I have a choice – I can move to a state where the laws are less restrictive. I have no problem with anyone advocating for what they think is right but don’t assume everyone thinks like you even if they have the same background – Oorah! That’s one of the best things about this country we live in. We can disagree and that’s totally fine. This is in reply to Sgt. Mike. You are incorrect when you say that Sheriff’s report to the county or state in which you are insinuating that they have to do as the county or state tells them to do. I don’t know which state you live in, but all the states that I have lived in during my 20 years in the Army, the Sheriff reports to the people who elected them. They run the county. To give you a prime example, the state I live has a few sanctuary cities and counties, but the newly elected governor wants to make the entire state like California; a sanctuary state. The mayor of the city i work in, and the sheriff of the county I live in, have both stated that they will not let their city and county become a sanctuary as long as they are in office because they don’t answer to the governor; they answer to the people who elected them. And if the federal government has laws that the state choose to disregard, then they will follow the Federal laws which are the law of the land. I’m not trying to offend anyone or step on toes, but I believe we need to remember that common sense has to come into play here. I personally believe they are referring to pistols and rifles, when they speak of what the military uses. In every day life, no one needs a cannon or some type of nuclear weapon. Although at some point, we might need something a little stronger than our basics. And I don’t think the Sheriffs would be having any special laws to go by. They took an “oath” just like we did in the service. They are bound by that oath, to protect and defend the Constitution of the United States of America. That’s just my two cents worth. Unlike chiefs of police who are appointed usually by the mayor or city coincil. County Sheriffs sware to uphold the Constitution of the United States first and the Constitution of their state second. They are by law the ultimate law enforcement official within their county. I am a fairly new gun advocate. I received an H&K 9 mm for Xmas 3 years ago. I own a Class A RV and go about this beautiful US by myself. I have it near me in the RV at all times. Since then I have purchased a SW 9 mm as a conceal carry. I also am involved in a 22LR league. No one, absolutely no one, will tell me I need to give my secondant amendment rights up. As of this comment I am 72 years old. I love guns and being able to protect myself. I have taken numerous classes on gun safety and self protection. I will be there if ever needed by a law abiding citizen and/or to protect myself and those I love. I am also a female! I spent 20 years as an USAF Air Policeman, 28 years as a County Deputy Sheriff Sgt and strongly support the right to own – carry a weapon. Before that I went thru a youth gun safety class before I could get a hunting license. I just cannot abide those who are surrounded by armed guards at home – work trying to tell others that they cannot protect self or families. They need to have the same applied to them if you could not have armed security if personally banned – might stop some of the BS. Our Founding Fathers were MUCH smarter and studied than the present crop of politicians. They spent years working on our Constitution, having seen that the Articles of Confederation didn’t work and fixed them. If we don’t like the Constitution, we have a way to change it but until we do, the 2nd Amendment should stand UNINFRINGED! I live in a 2A sanctuary *county*. The idea is sweeping through much of my state, despite Cook County (which has draconian gun control regulations and 80% of the state’s murders take place in that county alone). Our founding fathers were wise when they made it more than just a bit difficult to alter the Constitution. I like this article for it’s concept of 2nd Amendment sanctuary cities/counties. The author discussed a novel concept, and brought up several points worth research. Sgt. Mike, I applaud the civility and thought that went into your rebuttal. I’m also pleased that the comments have been civil. As opposed to many posts in the popular social media platforms, these are what the Founding Fathers meant when they discussed, and often cussed over the writing of our Constitution. I need to find a couple of beginner level classes on both my state and the Federal constitutions. Maybe something that was taught at Ellis Island. My state government teacher was a coach more intent on coaching than teaching. As a high school junior, I didn’t give near enough attention during what was a very thoroughly taught Civics class. What is truly sad, is that most Millenials and I Gens say they’ve never had a Civics class. WOW! Some Great comments! Even those I don’t agree with are well-stated. No name-calling or insults! States Rights were the true basis for the Civil War! Yes, slavery was the base of argument, but States rights vs Federal over-sight was the real issue. “Gun Control” is becoming much the same, today, among other things. “Arms” means ANY form of weapon! You can be “armed with a dinner knife” or “Armed with Nuclear devices”..!! So where IS ‘the line’ between civilian and Military? If civilians only have shotguns and bolt-action rifles, HOW are we ever going to be a deterrent to an over-stepping Government? BUT, if we allow every citizen to have Explosives and even nuclear devices, we will be in Chaos and daily RISK of some maniac attack! and if we make new Amendments that DO state types of ‘arms’, how will that be effective into the unforeseen future, as new types of weapons are developed? How do we even ‘define’ so-called “assault rifles”…? Simply because it has “Military-appearing features”…that make it Safer and more controllable and accurate? Why would the Military add those features if it did’t make the weapon more accurate? Isn’t that what we Also Want for civilian weapons? Will the People be Safer if all weapons are taken AWAY from civilians? Will Criminals still find ways to possess weapons? Will Foreign Nations think of us as a more Defenseless Target? Will we no longer be able to hunt for food, or defend our animals from attack by wild animals? Is EVERY person who possesses a weapon ‘automatically’ a Criminal waiting to Shoot someone? Like Sgt, Mike, and others here, I have been trained to kill, if necessary, with a Variety of methods and tools, including my bare hands and feet! An ink pen, pair of scissors, a drinking glass, or a thousand other methods. which ones will become “illegal”? Or is Murder simply illegal REGARDLESS of what tool you use..? If I sit down next to you on a public bus, with my concealed weapon(s)… are you Safer or more at risk? We can Never make Laws that will Stop a person whose Mind has lost respect for Life. All we can do is allow citizens a means to defend themselves if they encounter such a person. GOD BLESS The “CONSTITUTION of these UNITED STATES “, God Bless America, for what it is THE LAND OF THE FREE BECAUE OF THE BRAVE. AMEN. I am glad to see a conversation between real grown men and women talking without using any fowl language in their emails . I am a supporter of the 2nd Admendment all the way ,even tho I do not own any guns ,maybe some day before it’s too late I will have a couple or so.. I want to say Thank You to the men and women that served this great country we call home . I am a 65 y o veteran.I don*t believe there would be as many mass shootings if you didn*t know who had a gun.Even everyday shootings would be reduced.law abiding citizens that are sane should be able to carry.Over 35 or40 yrs old that are matyure &responsible.I wouldn*t hesitate to help someone in mortal danger whether innocent victims or targets of drive by shootings.If I can stop a bullet from killing someone and kill the shooter oh well.If you kill people and they are not threatening your life then you had it coming.I cant say if i*m carrying or not but I*D RATHER BE JUDGED BY 12 THAN BE CARRIED BY 6.As the old timers used to say when I was growing up PUT THAT IN YOUR PIPE AND SMOKE IT! It’s a human right to own a firearm to protect yourself and loved ones. It’s been labeled a 2a right, Wrong! It’s a GOD given right, Wrong! etc. etc… It is not! It is a HUMAN RIGHT! In THIS country our Founding Fathers created the Constitution of the United States of America and made the fact perfectly clear. The right to bear arms shall NOT be infringed! The Second Amendment was put in for that reason. So our human right cannot be infringed by government! We already have a Constitutional right to carry we just need to enforce it! We are the “United States” of America and the Constitution does not stop at state borders! We are a Free country. If you don’t want a gun, fine don’t have one. But, don’t try to tell me or the millions of people that do have one, that we can’t! We have never hurt anyone with our guns. We do not need another bill! 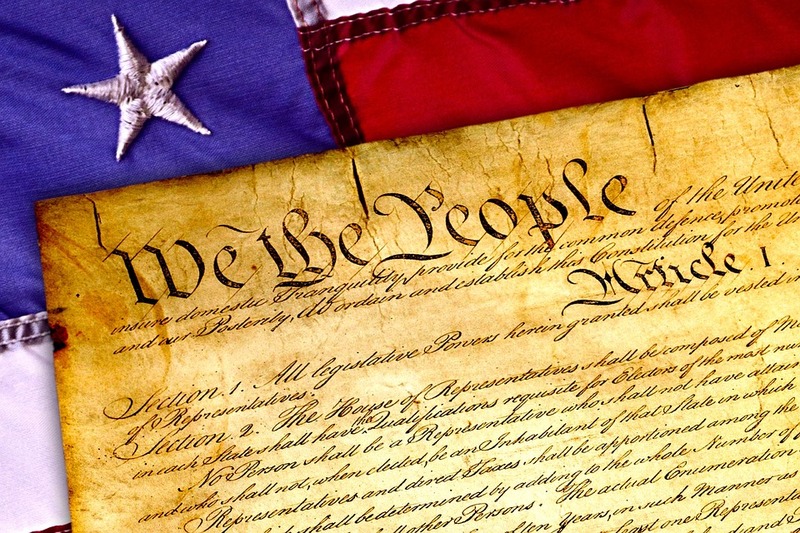 What we need is a [tooth clause] to the Constitution, Demanded by “We the People” Where if the State or Federal government infringes on our rights the offending officials are removed from office. Get rid of all the state regulation and infringement. It’s time to stop rogue State Officials from passing bills that don’t affect criminals, instead it punishes the law abiding citizen, and ignores the Constitution and the Oath of Office they have taken. REMEMBER they work for us! Our country wasn’t meant to be run on the opinion of Elephants and Jackasses. Mark if you want to learn about history and civics, find Tara Ross on Facebook. She does an excellent daily post concerning history from the revolutionary war to the present day and you’re guaranteed to learn something new.